If the private sector is serious about stamping out bribery, it must step up and cooperate with the Commission to Investigate Allegations of Bribery or Corruption (CIABOC), its top official said yesterday, calling on companies to work with its officials, insisting it would be faithful to its task. 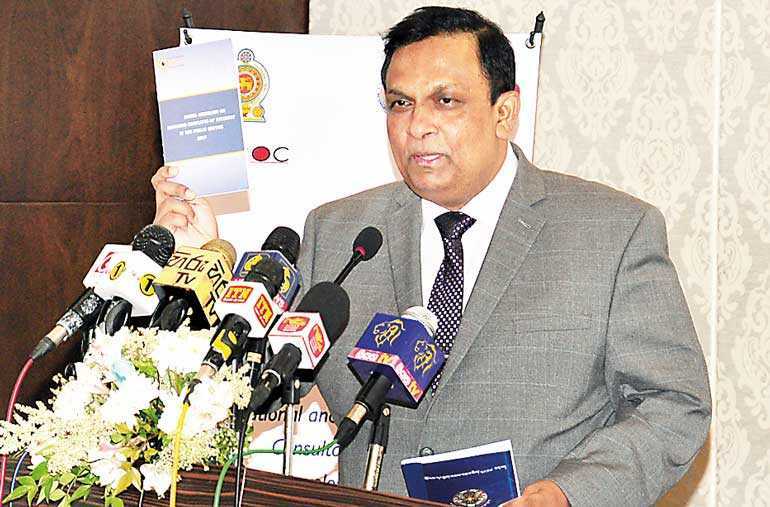 CIABOC Director General Sarath Jayamanne PC, addressing a forum of media and civil society to gather recommendations for the National Policy on bribery and corruption, noted that in the last year, 57 convictions had been made on cases of bribery and corruption with 40 more convictions handed down in the first six months of 2018. On average, about 10-15 convictions were the norm in previous years, he added. “Everyone is waiting for us to catch the next whale. Well, if you want to catch whales then whales have to be willing to give evidence. The last high profile case where we arrested a top official was possible because we had a whale who reached out to us and made a complaint,” Jayamanne told the gathering, referring to the President’s Chief of Staff I. H. K. Mahanama and State Timber Corporation (STC) Chairman P. Dissanayaka, arrested by the Bribery Commission in early May while in the act of accepting a bribe of Rs. 20 million from an Indian businessman. Recalling the investigation, Jayamanne emphasised on the high levels of discretion maintained by the Commission in its long investigation, despite their interaction with the main suspects. He noted that the President’s Chief of Staff had even accompanied CIABOC officials on a tour of Bhutan during the investigation period but had not been aware of the Commission’s activities. “This is the level of professionalism that CIABOC officials are capable of and you must have faith in us. I invite the private sector to join us and work with us to stamp out corruption. We are working very hard to expand the number of people working with us because we understand that to stop these crimes we need auditors, accountants and others. If you are engaged in these professions, my appeal is to please come and work for the country. Don’t think only about the salary,” he said. Two hundred new positions had been gazetted last month, the Director General said, which is aimed at increasing the level of competency of CIABOC. He also pointed out that Sri Lanka’s public needs to engage in fighting consistently and not just when a new government comes into power. “When governments change is when we get the bulk of complaints, but this puts enormous pressure on us because we are then expected to investigate and file cases for a large amount of complaints within a very short period of time. We have to work to maintain law and order all the time no matter which party or which government is in power. That is our responsibility,” he said. Jayamanne gave numerous examples from Singapore, Malaysia, Hong Kong and Bhutan where laws define conflict of interest and enforce strict guidelines on gifts that can be accepted by public officials, including parliamentarians. He advocated that similar rules and laws should be implemented in Sri Lanka as a measure to prevent bribery and corruption.